The original box is still in the Van Gogh museum in Amsterdam which seems like another good reason to plan a trip - the last time I visited the city, the museum was closed. I now have a growing list of good reasons to go again, and feel I should start researching yarn shops there too. Have you ever been to the museum? Did you see this box? Do you have any recommendations for a 'yarn crawl' through Amsterdam? I agree, another good reason to visit Amsterdam. I have only heard good things about Amsterdam from people who have been there. ..I simply must go there one day! That is fascinating. 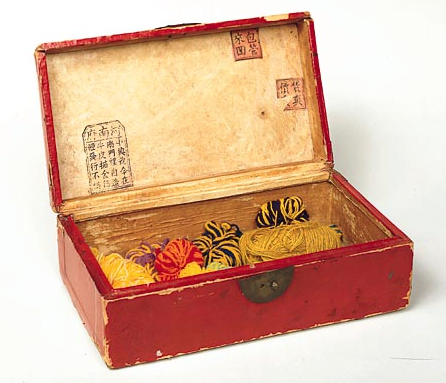 I keep scraps of yarn in a similar box. I went to the Van Gogh museum in 1976(!) but was too young to appreciate it and don't remember the box....or anything else. What a philistine! How clever of him to use yarn to get a visual of his next painting's color palette. =) glad I shared ! Love your blog, too!